It seems like it’s been forever and a day since I’ve done any baking! And since I found myself today with only the boys (a huge shout out to Scott’s mom and dad for taking Landri), I decided to take advantage and do some fun things with Rex and Ty! First we went swimming at the gym after my yoga class and they both totally rocked it, doing floats, playing, and having fun. Then we went home and Ty promptly fell asleep, leaving me with some extremely precious one on one time with Rex! He agreed that making cookies would be a fabulous idea and we flipped through my vegan cookie cookbook to see what all we could make (without having to go to the store). I was delighted to see a recipe for Blackstrap Gingersnaps because our hotel in New Orleans for the marathon had a jar of these at the front desk and I’m pretty sure that Tara and I never walked by without grabbing some, LOL! I absolutely adore gingersnap cookies! So much for my raw diet today, eek! 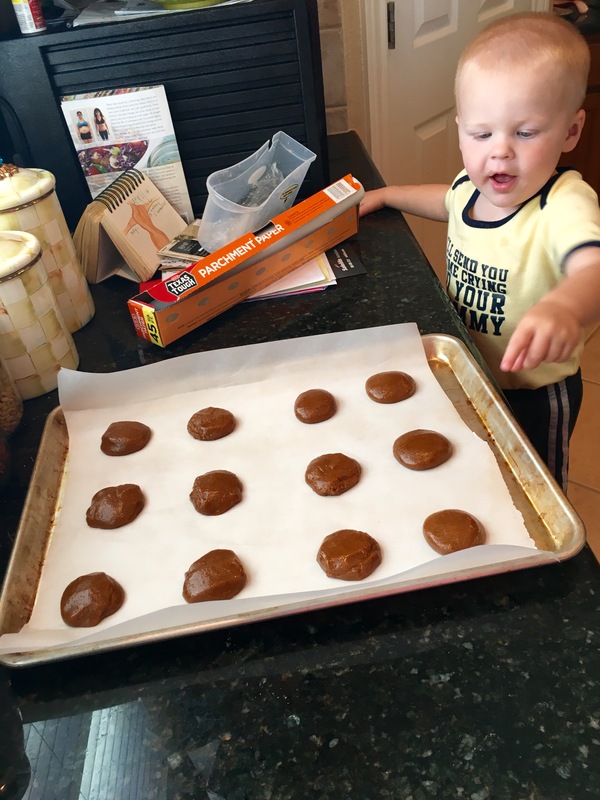 So we began making them – Rex was such a great little helper, carrying ingredients out of the pantry and setting them on the counter for me. He also helped dump the measured quantities into the mixing bowl and practiced his counting. And then as we really got going, I realized I was missing a key ingredient: SUGAR!!! How on earth are we out of sugar, by the way?! After some quick online research, I decided to give Turbinado sugar a shot as a substitute (which of course we did have, haha). And I’m happy to report that luckily, the cookies still turned out great and I can only imagine how much more awesome they would be with regular (vegan) granulated sugar. You guys should totally check out this recipe if you like gingersnaps as much as I do! The recipe is in the photos below. PS. Speaking of sugar, did yall know that most American white sugar is filtered through cow bones? Because that’s totally necessary! 😉 And speaking of veganism, I just got back from Veg Fest in Austin – an all vegan festival and it was amazing! For me, the main highlight was eating the best taco of my life (from The Vegan Nom) and also enjoying the frozen banana treats from Bananarchy (frozen bananas dipped in chocolate and then rolled in different toppings such as crushed Oreos, graham crackers, peanut butter, coconut, all kinds of yummy stuff). The big kids agree about the banana treats but also LOVED their Henna tattoos. Yes, even Rex got one – but we had them do a football instead of a pretty flower design like me and Landri! It was a really cool festival – yall should go if you ever get the chance! They are in cities all over! Next Post Mobility, Mobility, Mobility. Yes, x3.